“Us” (2019) is written and directed by Jordan Peele. As Friedrich Nietzsche once wrote, “If thou gaze long into an abyss, the abyss will also gaze into thee.” At one point or another, everyone has stared at their reflection in a mirror and wondered, if only for the briefest of moments, if there was something looking back. This fear, and the deeper question of one’s own hidden nature, fuels “Us,” Jordan Peele’s latest psychological horror film. After his widely acclaimed debut, “Get Out,” it was unclear whether Peele would be able to live up to the legacy of his first film. 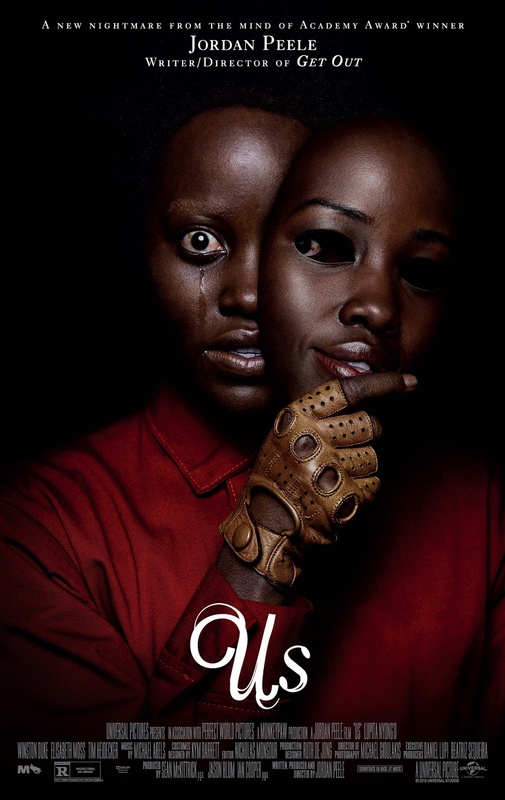 In comparison to its predecessor, “Us” falls a bit short in depth and intrigue, but is still an extremely technical and captivating film that confirms Jordan Peele’s status as one of Hollywood’s most promising and capable storytellers. To get away from their busy lives, the Wilson family takes a vacation to Santa Cruz, California. Unbeknownst to the other family members, the family’s matriarch, Adelaide (Lupita Nyong’o), is haunted by a traumatic event that happened on the Santa Cruz beach when she was a little girl. One night, the demons from her past return, and the Wilsons suddenly find themselves terrorized by their scissor-wielding doppelgängers. There are many things that the film gets right, be it the likable characters, the moments of levity interspersed among the dark ones, or the captivating imagery and themes that continuously reappear. However, for a horror film to ultimately succeed, it must be scary. “Us” is scary. 20th century directors artistically generated fear through music, atmosphere, lighting, and disturbing images and events. In recent years, the horror genre has tended to stray away from these tactics, popularizing cheap “jump scares,” loud noises or sudden movements to get viewers’ hearts racing. Peele opts for the former and builds a terrifying experience through his intuitive understanding of how the best horror films work. Harvard professor Steven Schlozman aptly explained in his TED Talk “What horror films teach us about ourselves and being human” that horror films are most effective when they utilize two concepts: violations of patterns and the feeling of dread. Pattern violation occurs when viewers see familiar concepts in unfamiliar circumstances. These violations generate strong feelings of uncertainty and fear in viewers. For instance, when people see a clown at a circus, they recognize the clown and that it belongs. When people see a clown in a storm drain, they perceive the clown but realize that it should not be in this context. This pattern violation generates fear, and Peele handles these violations masterfully in “Us.” When the doppelgänger family first appears, they are instantly recognizable and familiar, and one can instantly understand that they should not be standing at the end of a driveway, hand-in-hand, shrouded in complete darkness. Such uncanny, disturbing images and pattern violations recur through the entirety of the film and make for an endlessly frightening, thrilling viewing experience. Furthermore, the pervasive feeling of dread is crucial in setting the film’s ambience. After their initial introduction, there are no doubts as to the goal of the doppelgänger family. If they manage to get ahold of the Wilson family, they will kill them. This impending and unresolved threat adds tension and suspense to every scene, as the doppelgängers can be hiding anywhere and can appear at any time. Peele expertly crafts the imagery and themes that recur throughout the film. He relies heavily on shadows and reflections to represent his characters’ dual natures. It is fascinating to see where these reflections pop up, and their unpredictable apparitions further elevate the sense of dread, as Peele insinuates that the Wilson family and their doppelgängers are never truly apart. His use of sound is also impressively nuanced. Rather than opting for loud, grating music, Peele interjects scenes of heavy silence, where each sound can be nerve-wracking. The true gems of the film, however, are the actors themselves. Each actor plays both a “real” character and that character’s terrifying doppelgänger. All of the actors, including a precociously talented 10-year-old Evan Alex, make each character feel genuine and believable. Nyong’o gives the film’s standout performance as both Adelaide Wilson and her doppelgänger, Red. Her portrayal of Red is awe-inspiring, and she is completely believable in both roles. Nyong’o’s performance is as remarkable and Oscar-worthy as any given by an actor this decade. That being said, “Us” is not perfect. Some plot points feel extraneous and confusing, and the film would’ve been improved by their exclusion. To that same effect, Peele tries to provide some clues into and explanations for the strangeness of the characters’ circumstances, but the intricacies of these explanations may be lost during an initial viewing. The film’s allegory also becomes muddled and confused as a result. However, one might find these problems rectified upon a second viewing. Starting over at the beginning with all the pieces of the puzzle makes it easier to spot the subtle clues that Peele weaves throughout the film and reveals how he has skillfully crafted the narrative. Watch the film once for the thrills and scares. Watch it twice for the deeper meaning. Despite the film’s minor shortcomings, “Us” is another impressive addition to the horror genre. Peele’s mastery of horror techniques, his innovative approach to traditional ones, and the film’s strong cast make “Us” a film that shouldn’t be missed. With Peele’s legacy cemented, it will be interesting to see what he makes in the future. Whatever he makes next will have the world’s attention.